Over the past year, a gallon of regular unleaded has increased by 63 cents, a bigger jump than in 45 states and the District of Columbia. 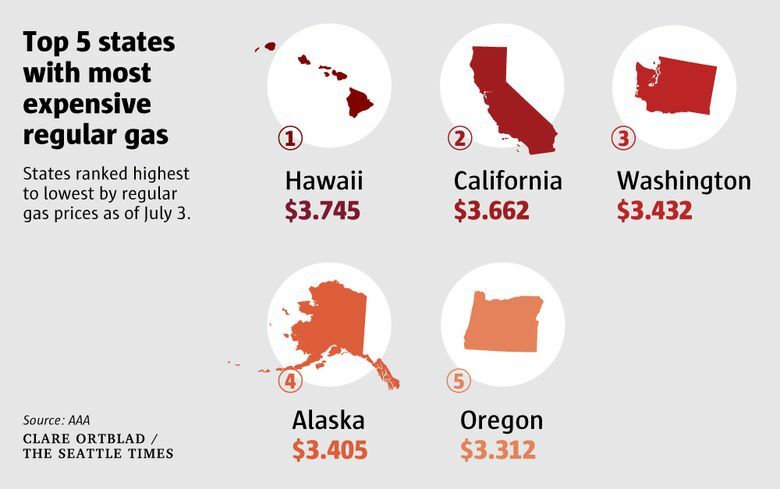 Washington gas prices have soared over the past year to among the highest in the country, but that’s not expected to change anyone’s summer driving plans, according to the American Automobile Association (AAA). The state’s average gas price per gallon is the third-highest in the nation and is 20 percent higher than the national average, according to AAA data. Over the past year, the price of a gallon of regular unleaded has increased by 63 cents, a bigger jump than in 45 states and the District of Columbia. Jennifer Cook, spokeswoman for AAA of Washington, said her organization projects about 47 million Americans traveled during the Fourth of July holiday stretch, a 5 percent increase over last year. Surveys from AAA clubs around the country indicate that Seattle will be among the top three domestic destinations, behind Orlando, Fla., and Anaheim, Calif., Cook said. That’s partly because the city is a starting point for cruises to Alaska. Still, this year’s rising costs at the pump are nowhere near the record set on July 6, 2008, when regular unleaded reached $4.35 a gallon. While higher prices in Hawaii and Alaska are attributed mostly to the cost of transporting fuel, in Washington, Oregon and California, prices are boosted by stricter standards for fuel cleanliness, Cook said. Washington drivers pay 67.8 cents per gallon in taxes, 49.4 cents a gallon to the state and 18.4 cents to the federal government. That’s the second highest gas tax in the nation after Pennsylvania, where drivers pay nearly 77 cents per gallon. Eastern Washington has less expensive gas than the western part of the state because the region uses cheaper, dirtier crude oil from Montana rather than the cleaner kind imported from Alaska and Canada, she said. Of those travelers — about one million of whom originated in Washington — 85 percent traveled by car, she said. And the travel boom is forecast to last all summer, likely setting new records, she said.